Installing WordPress on Heroku Cloud With Free SSL Video Guide works as a complimentary guide with previous text based step by step guide to Install WordPress. You can open the Installing WordPress on Heroku Cloud guide where we actually have used Heroku Cloud through Heroku Hosted Facebook App to get the SSL for free. The intention of this Installing WordPress on Heroku Cloud is to make the tutorial written in text to an audio visual happening. The _URL has been added now for posgresql. There is practically no meaning to make a new user confused with lot of links. The previous text based step by step guide to Install WordPress has enough needed links for the purpose. So here is the video. With this principle of use you can install any web software like MyBB Forum Software. The catch is, you can not update or upload zip files on this default Heroku Cloud setup. 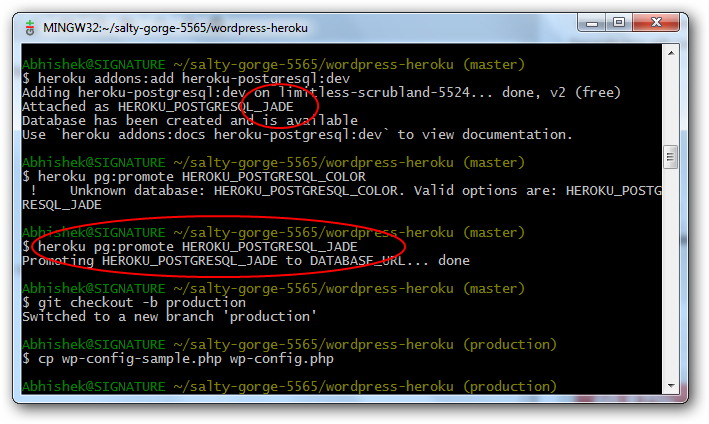 You have to do some extra steps like we mentioned before in this guide on advanced Heroku Commands, real webroot setup. This Article Has Been Shared 540 Times! Cite this article as: Abhishek Ghosh, "Installing WordPress on Heroku Cloud With Free SSL Video Guide," in The Customize Windows, January 11, 2013, April 23, 2019, https://thecustomizewindows.com/2013/01/installing-wordpress-on-heroku-cloud-with-free-ssl-video-guide/.